In the NPR Article below by Gabrielle Emanuel we learn about how very difficult it is to be a homeless woman living on the streets. This and the links throughout the article are important to reflect on as we consider how we can be there for homeless women, men, youth and families. In my experience in working with homeless women since 1982 in three cities, reaching out does matter and more often than not makes a big difference. It is when we turn away and say “they want to live this way” that the tragedy of homelessness continues. This link was sent to me by Rev.Debbie Little, founder of Ecclesia Street Ministries and mentor to many street ministers. Ecclesia and Street Ministries make a difference and we at Good Shepherd Ministries of Southwest Florida are honored to be associated with them. You know from former blogs that we were able to house five women who have been homeless this summer. This was a major blessing and the culmination of lots of groundwork, relationship building and prayer. Now some of these women are ministering to others who face homelessness and that is the greatest blessing. This is Rose getting the key to her new apartment. It does help to be able to intervene before chronic homelessness spans years as in the NPR article. But even when women experience chronic homelessness, loving, accepting, patient relationships and skills in leaving no stone leading to health and housing unturned pays off. 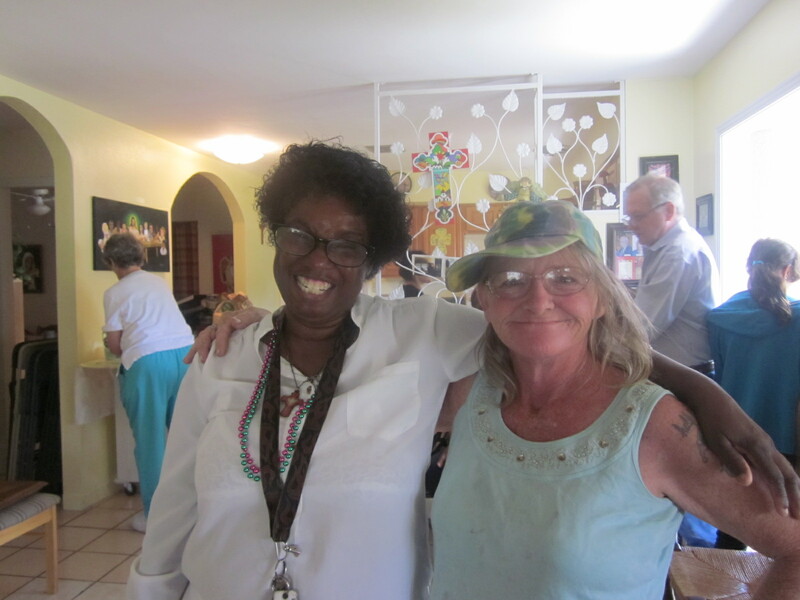 On the right is Lauretta who had been chronically homeless over many years,disruptive and not welcome in any church or service agency in Fort Myers until she responded to the love and acceptance of our Good Shepherd ministry. Her story under her “pen name” Marietta for she wrote a part of the story herself is in my book Come By Here: Church with the Poor, 2010,Publish America now America Star Books.com. But the best part of the story is that it continues to be a story of a woman who is housed since 2009, happy and reaching out to family and others who are homeless to offer hope and help. Today we had our Tuesday Ministry and Lauretta shared with us how she is helping a relative who has cancer and is homeless with a child. She knew that we would help her to help this woman. One of the women,Diane, whom we housed this summer was brought to us by Lauretta who found her in the same park where we offered meals on Friday nights in 2007-2009 and where we met Lauretta. We also celebrated her birthday today, along with Betty’s and Louie’s both of whom we housed this summer. What a joyful celebration we had! But at the same time we had two men with us who were still homeless and whom we promised to continue to help toward housing. Yet they are hopeful because they know that if Lauretta and Louie who were chronically homeless can be housed, they can too. For us, it is not fast enough and the road is hard for all who live outside, but when we walk it together as a church community, with Jesus who brought good news to the poor and asked us to follow, it is easier. 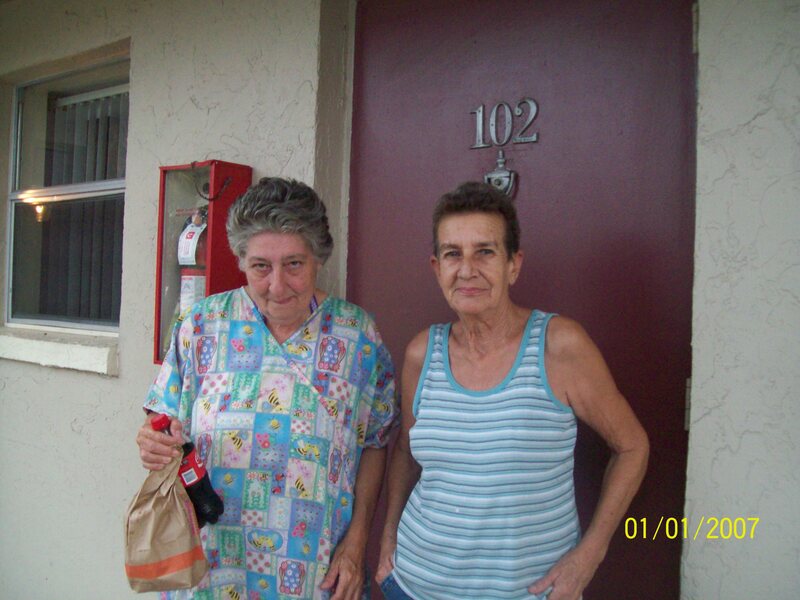 This is Daine on the left and her new friend and neighbor, Bev in front of Diane’s door. Lauretta, once chronically homeless, was the one who brought Diane to us . Diane loves her new home. We pray for outreach to “Susan” and to all who are homeless and for the multiplication of housing resources. No One should have to live outside. 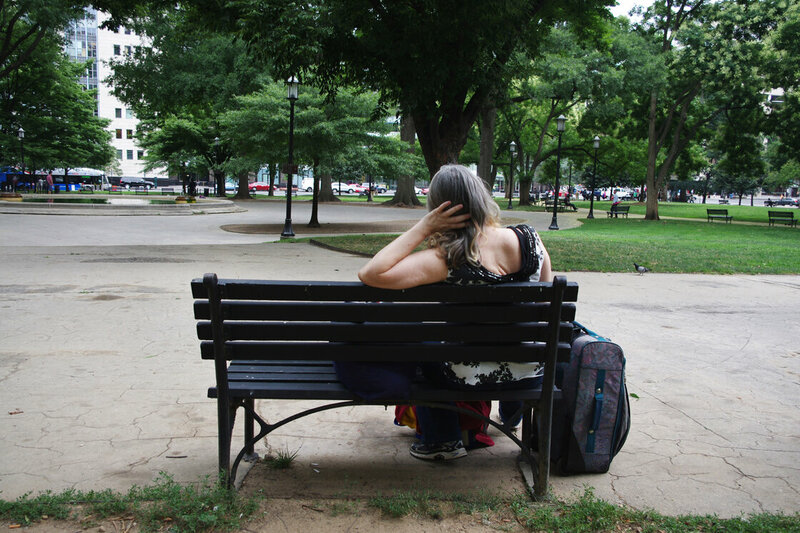 Susan sits on a park bench in Washington, D.C. She has struggled with homelessness for nearly two decades. The grass is fraying around the edges in Washington, D.C.’s Franklin Square Park, but the trees are more important. They offer much-appreciated shade to the homeless people who sit below. Many of the park benches are occupied by homeless men — but there are a few women too. Susan, sitting amid her bags in the park’s northwest corner, is one of them. She’s been on and off the streets of Washington since 1995 and asked that her last name not be used because she was in an abusive relationship and doesn’t want her whereabouts known. Susan says life on the streets is a constant battle for all homeless people, but for women it’s particularly hard. On top of the everyday challenges of finding food and a safe place to sleep, she says, women face the threat of sexual violence and cruelty. In nearly two decades on the streets, Susan, with graying hair and bright eyes, has learned some tough lessons. When darkness falls, Susan pulls out her dark and bulky clothes. A slight Boston accent betrays her childhood origins, and it’s particularly strong when she speaks of her children and grandchildren. But Susan says those relationships are complicated. Susan is what experts call a rough sleeper; it’s a small and hard-core subset of the homeless population. Research suggests this group often struggles with mental health issues and substance abuse, but their defining feature is that they choose not to go into shelters. Susan sometimes stays in shelters but she doesn’t like them. There is no place for her bags and she finds them rigid, with strict curfews and rules. After decades as a rough sleeper coming and going, Susan’s confident about her strategies. That means screaming, cursing and acting wild. Dr. Jim O’Connell, president of the Boston Health Care for the Homeless Program and a physician who has been caring for the homeless population for almost three decades, confirms that Susan’s hard-learned lessons hold up more broadly. O’Connell says that on the streets of Boston, homeless men outnumber women 3 to 1. And those women are “among the most vulnerable” members of the homeless population. Thus, he says, disguising yourself as a man can be a good strategy. How about what Susan calls acting crazy? Both strategies, O’Connell says, are safety strategies. “Where they are probably going to be the victim of some kind of violence, they don’t want it to be sexual violence,” he says. For a rough sleeper, much of the day can be spent planning where to sleep. She checks out who is in the area, but she also takes a look at the nearby buildings. That way when dusk starts to wipe away the trees’ shadows, Susan knows where to go. She gravitates toward big public buildings. They represent one thing to her: safety. “[If] somebody [is] chasing me and trying to cause me problem, then I look at the closest place that I can go and what its affiliation is — the United States Capitol, the White House, the Senate Buildings, an embassy,” Susan says. Crossing onto their property is like calling 911, for someone who doesn’t have a cellphone. More than dressing like a man or seeing the protection of public buildings, Susan says she’s learned the importance of being associated with a man — ideally he’s ex-military, trained in survival. Jim O’Connell, the expert on homelessness, has seen this dynamic many times. “The underbelly of that protection, though, is it’s frequently someone who has a streak of violence,” he says. This can be physical and sexual. “And then the issue of domestic violence becomes a really paramount issue,” O’Connell explains. He says it’s nearly impossible to pull homeless women away from abusive relationships. The women prefer the predictability of one man’s violence to the unpredictability of street violence. She says decades of rough sleeping have taught her that women on the streets can be as tough as men — but they have to be smarter. Gracias, querida Judy, por este compartir. Impresionantes historias. Bendiciones.